Designed to appeal to students, Canson XL pads contain more sheets at a comparable or better price than other value pads in the marketplace. What's more, because they're developed in consultation with art professors who use Canson's professional artist papers as a benchmark, XL papers incorporate many professional performance characteristics — at a value price. 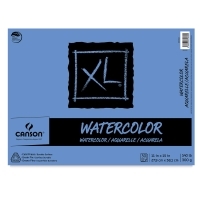 Canson XL Watercolor Pads feature 30 sheets of 140 lb (300 gsm) student-quality paper, ideal for a variety of watercolor and mixed-media techniques. The paper is acid-free with a cold press texture. The pads feature a heavyweight fold-over Euro Fold cover that makes them ideal for field work as well as the studio. Wirebound Watercolor Pads — This top-selling Canson watercolor pad is now available in a wirebound format! 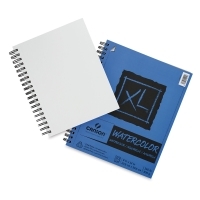 The durable, textured cold press paper in Canson XL Wirebound Watercolor Pads stands up to repeated washes and other watercolor techniques. 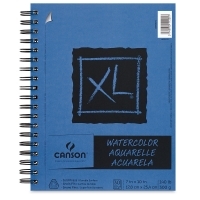 It also works beautifully with acrylics, pen-and-ink, markers, colored pencils, pencils, charcoal, and pastels. It has a smooth surface on the flip side. These pads hold 30, 140 lb (300 gsm) sheets that are true size when removed at the micro-perforation. Designed to appeal to students, Canson XL pads contain more sheets at a comparable or better price than other value pads in the marketplace. 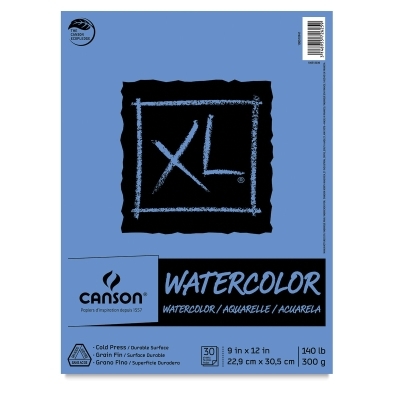 What's more, because they're developed in consultation with art professors who use Canson's professional artist papers as a benchmark, XL papers incorporate many professional performance characteristics — at a value price. Canson XL Watercolor Pads feature 30 sheets of 140 lb (300 gsm) student-quality paper, ideal for a variety of watercolor and mixed-media techniques. The paper is acid-free with a cold press texture.